When the sun goes down, it is time for citizens in Saigon start their new life at night. 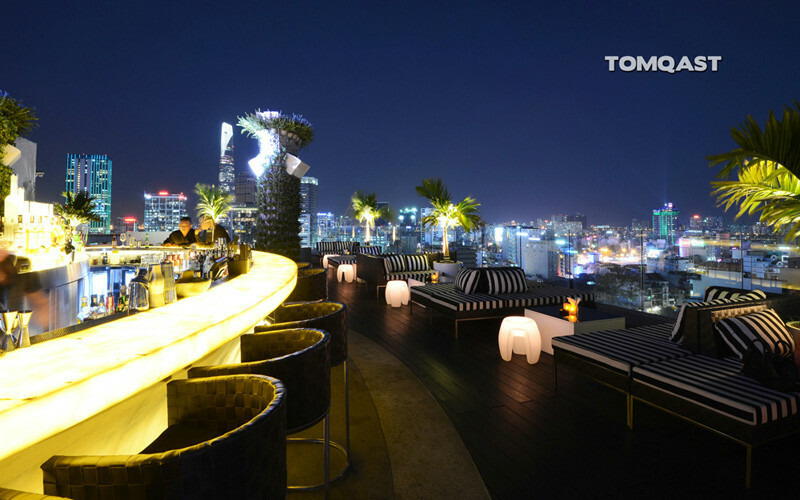 While some office staffs and businessmen simply would like to go home and cook for dinners, other younger people want to find an escape from the daily routine in rooftop bars. 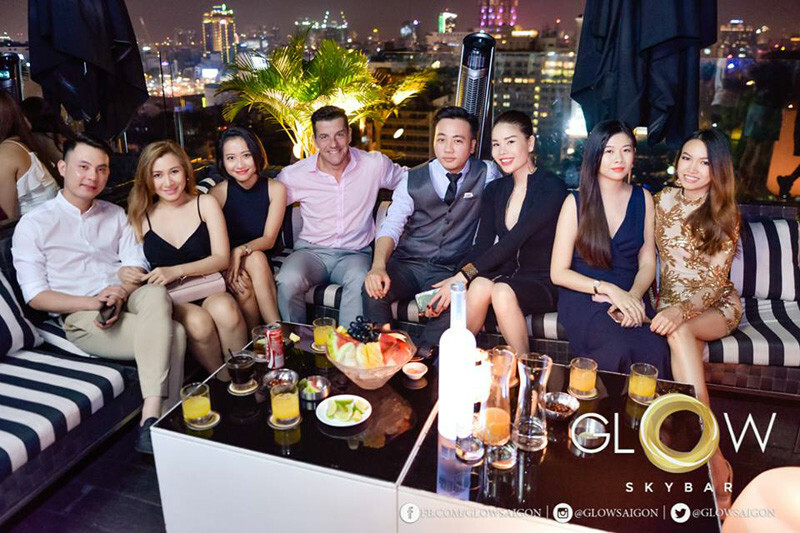 If it is your trend, then Glow Sky Bar becomes a perfect choice that offers you mystical vistas, dizzy heights of surroundings, and luscious cocktails. 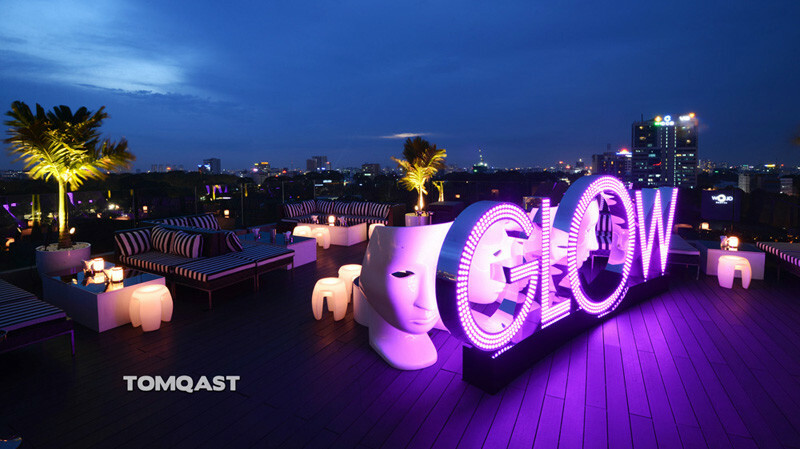 Situated at the top of President Place building on 93 Nguyen Du Street, Glow Sky promises to bring one of the best views in the whole city. Whether you set foot on here for a romantic evening or a sunset drink, there is no room for disappointment or dissatisfaction at all in Glow. From a distance, the design of the bar is true to its name. You can feel its glow from the first time of entering. Prominently standing out at the bar’s entrance is a brightly lit sign that draws selfie-taking guests and photographers. A splendid staircase, which leads to the bar from the elevator, is also another similarly photogenic spot. All gives a breathtaking effect at night. The space is not too small or not too big. It feels comfortable with 50 to 200 visitors. Harmoniously arranged with plenty of tropical trees, spacious dance floor, black-and-white furnishing, along with a fully-stocked bar on the main deck, this rooftop bar mostly attracts well-dressed tourists, expats and locals who love history and music. 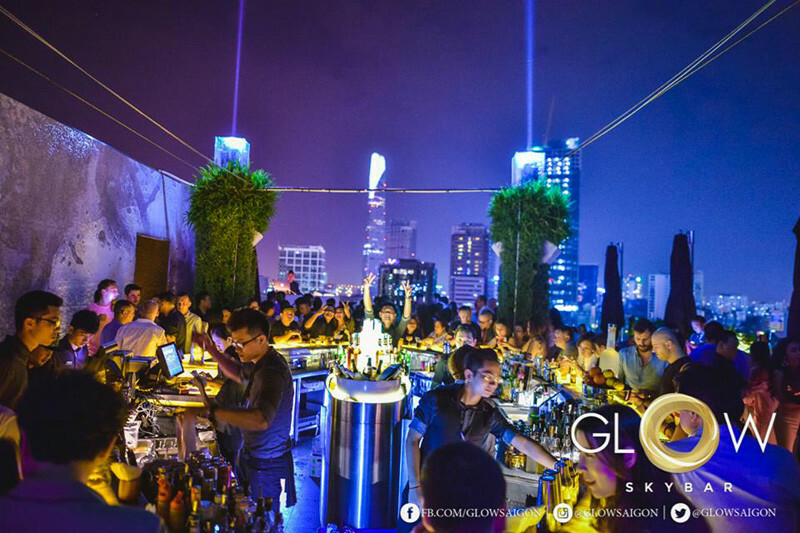 According to many guests, Glow gives a little more welcoming and relaxed feeling than other sky bars in the city. Staffs are attentive, friendly, and always keep smiling on their lips. Don’t miss a “Happy Hour” promotion that is between 5 PM to 8 PM, where you are quite able to enjoy a 50% discount on beers, wines by the glass, mixed drinks, and signature cocktails. After dancing, if you feel a bit peckish, the bar also serves an array of sharing platters at a reasonable cost (about 100,000 VND). Interestingly, you may freely have informal conversations with friends, partner or colleagues here as Glow just opens quieter music. 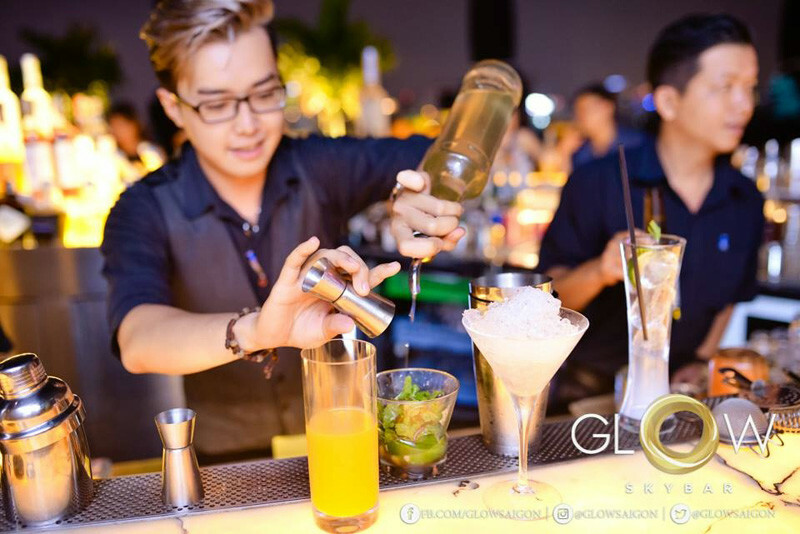 It has an extensive menu of drinks and snacks, tastily including mixed cocktails and imported liquors (detail: http://www.glowsaigon.vn/menu). If you would like to immerse in a different scene, then a club below the bar, namely PLAY, can satisfy your need. 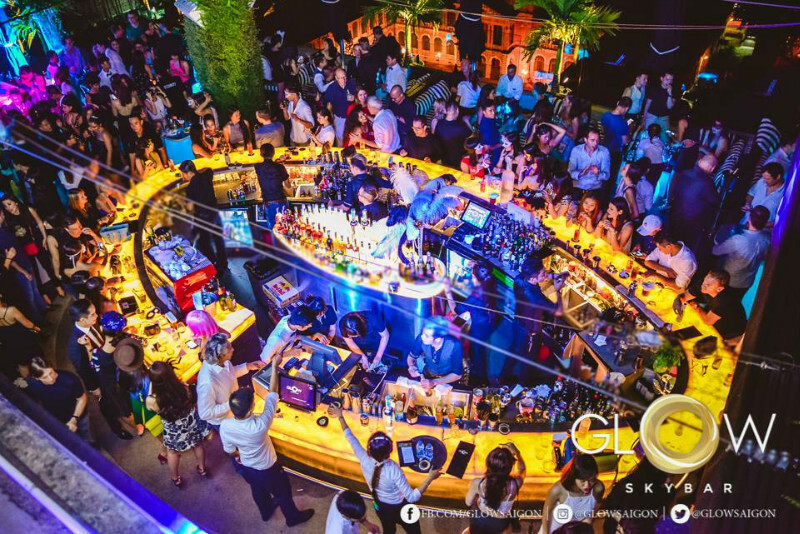 Glow Sky Bar is a flawless spot for an early evening drink and a comfortable chat. Later in the evening at the weekends, it also hosts many excellent performances of local and international DJs, musicians and entertainers. At that time, Glow’s vibe seems to be more like a club. There is a strict dress code for visitors to adhere to: No shorts, no flip flops, but tank tops are acceptable. Make sure that you follow their rules for a fun and memorable experience!